The easy 350 airbrush is a basic, simple spray workhorse. It is easy to operate and maintain and features a light, durable nylon airbrush body, single action simplicity, external mix easy nozzle maintenance, and can be used for craft, automotive, and hobby projects. Also is superb for base coating, stenciling, stippling, and touch-up projects. 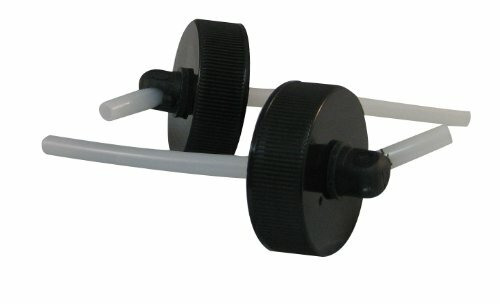 Has a 1/4-inch to 2-inch spray pattern. This airbrush sprays properly reduced acrylics and high viscosity materials such as enamels and ceramic glazes and stains. This set contains one easy 350 airbrush, one air hose, two jars, one jar adapter, and instructions. All other supplies and materials sold separately. Made in USA. The 350 is an external mix airbrush. Air and paint mix outside the airbrush, creating a larger, coarser “dot "pattern and providing a heavier spray volume. The 350 is superb for base coating, stenciling, stippling, touch up projects, etc. An excellent choice for beginning students, hobbyists, ceramists, and automotive painters. This model sprays high viscosity materials such as ceramic glazes and stains, and hobby enamels with ease. It is also effectively used with properly reduced acrylics, inks, dyes, watercolors, acrylic, lacquers, enamels, Air-Opaque, Air-Tex, SpectraTex and MODELflex airbrush colors The Model 350-2(M) set contains 350 medium nozzle airbrush with attachable jar, vinyl air hose, additional jar with cover, propel regulator ,wrench for needle assembly and instruction manual. Proudly made in the USA. 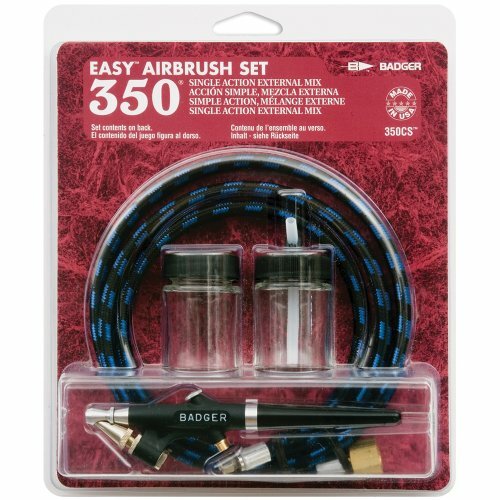 Badger Air-Brush Co. 350-8 (M) Ceramic Set. An excellent choice for beginning student ceramists. The 350 is an external mix airbrush; air and paint mix outside the airbrush, creating a larger, coarser "dot" pattern and providing a heavier spray volume. The 350 is superb for base coating, stenciling, stippling, touch up projects, etc. This model sprays high viscosity materials such as ceramic glazes and stains with ease. Set contains a Model 350 airbrush with a medium (M) fluid tip and needle assembly, attachable glass jar, extra jar cover, additional glass jar with cover, heavy-duty braided air hose with varying air source fitting, and head wrench, and instruction manual in a durable corrugated storage box. Proudly made in the USA. The 350 is an external mix airbrush. Air and paint mix outside the airbrush, creating a larger, coarser “dot" pattern and providing a heavier spray volume. The 350 is superb for base coating, stenciling, stippling, touch up projects, etc. An excellent choice for beginning students, hobbyists, ceramists, and automotive painters. This model sprays high viscosity materials such as ceramic glazes and stains, and hobby enamels with ease. It is also effectively used with properly reduced acrylics, inks, dyes, watercolors, acrylic, lacquers, enamels, Air-Opaque, SpectraTex, Air-Tex and MODELflex airbrush colors. The Model 350-1F set contains 350 fine nozzle airbrush, attachable jar, additional jar with cover, wrench for needle assembly and instruction manual. Proudly made in the USA. The 350 is an external mix airbrush. Air and paint mix outside the airbrush, creating a larger, coarser “dot" pattern and providing a heavier spray volume. The 350 is superb for base coating, stenciling, stippling, touch up projects, etc. An excellent choice for beginning students, hobbyists, ceramists, and automotive painters. This model sprays high viscosity materials such as ceramic glazes and stains, and hobby enamels with ease. It is also effectively used with properly reduced acrylics, inks, dyes, watercolors, acrylic, lacquers, enamels, Air-Opaque, Air-Tex, SpectraTex and MODELflex airbrush colors. 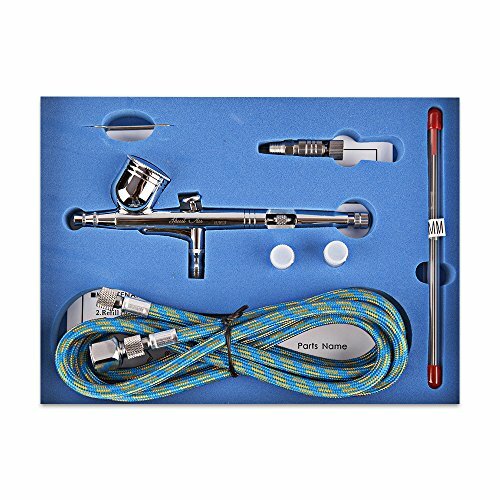 The Model 350-1H set contains 350 heavy nozzle airbrush, attachable jar, additional jar with cover, wrench for needle assembly and instruction manual. Proudly made in the USA. The 350 is an external mix airbrush. Air and paint mix outside the airbrush, creating a larger, coarser “dot "pattern and providing a heavier spray volume. The 350 is superb for base coating, stenciling, stippling, touch up projects, etc. An excellent choice for beginning students, hobbyists, ceramists, and automotive painters. This model sprays high viscosity materials such as ceramic glazes and stains, and hobby enamels with ease. It is also effectively used with properly reduced acrylics, inks, dyes, watercolors, acrylic, lacquers, enamels, Air-Opaque, Air-Tex, SpectraTex and MODELflex airbrush colors The Model 350-9 (M) set contains medium airbrush with attachable jar, propel regulator, vinyl airhose, and wrench for needle assembly on blister card. Proudly made in the USA. 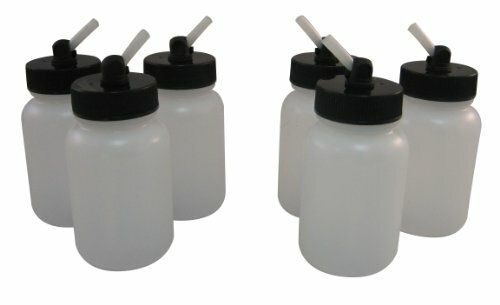 Badger Air-Brush Co. #51-0056B 3-ounce durable, plastic, frosted jars with Fast Blast Adaptor cap (box of 6) will fit Badger 350 Adaptor (2 3/4-inch Tube). Features 33 millimeter neck and 60 degree angle configuration for proper alignment. Distributed by Badger Company. Looking for more 350 Airbrush Set similar ideas? Try to explore these searches: Bracket Garmin Parts, Pink Camo Car Seat, and Ice Dry Ice. 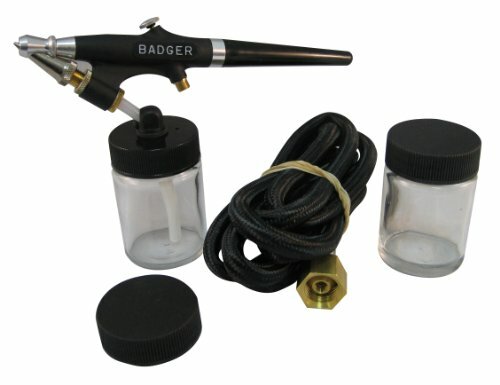 A brief review of the Badger 350 single action suction feed airbrush.